Like her previous film, Chisholm '72: Unbought & Unbossed (2004), Lynch offers a loving, generous, yet critically astute view of a Black woman political icon, whose story has often received short-shrift in comparison to some of her male comrades. Lynch’s Free Angela and Other Political Prisoners pivots on three aspects of the Angela Davis story—the most obvious and well known being her implication in the murder of Superior Court Judge Harold Haley. The judge was killed in what was a botched attempt to free the Soledad Brothers—George Jackson, Fleeta Drumgo and John Clutchette—who were accused of killing prison guard John Mills in California’s Soledad Prison. 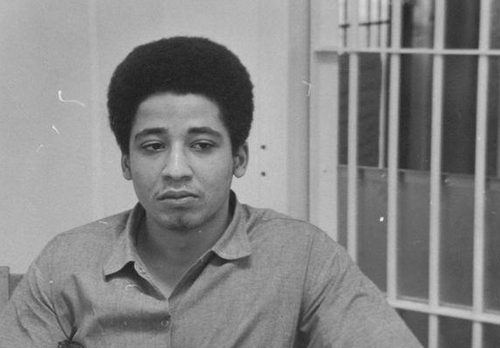 George Jackson’s teenage brother Jonathan, who helped plan the escape plot, was killed in the incident. The Soledad Brothers were eventually acquitted in March of 1972, with the exception of Jackson, was killed in prison violence the year before. At the time Judge Haley’s death, Davis was embroiled in a battle with the University of California Board of Regents and then Governor Ronald Reagan, who fired Davis from her position at UCLA months earlier for so-called “unprofessional behavior” in response to the revelation that Davis was a member of the American Communist Party. Davis, who purchased several guns in order to protect herself in the face of death threats became a convenient scapegoat in the murder of Judge Haley, when the guns used in the escape and kidnapping were traced to her. Fearing for her life, Davis became a fugitive for several months, becoming only the third woman to be named on the FBI’s ‘Most Wanted” list. The story of Davis’ flight, the coast-to-coast search for her (she was found in a Howard Johnson Motor Lodge in New York City) and the subsequent trial would have made a fine post-modern escaped slave narrative in its own right (don’t get no ideas Tarantino), but the brilliance of Lynch’s film is her focus on the national and international response to Davis’ capture and imprisonment and the tender personal relationship between Davis and George Jackson that became a focal part of her trial. Indeed if there is a story to be told about Angela Davis’ rise to public consciousness, it is the wellspring of support that her incarceration generated, emanating from traditional Civil Rights Leadership like Rev. Ralph Abernathy—who frames the State as “pharaoh” in dramatic footage in the film—to elected officials like Brooklyn Congresswoman Shirley Chisholm, who would make a run for the Democratic Party’s presidential nomination in the shadow of Davis’ case. Artists offered musical tributes to Davis, including Yoko Ono and John Lennon (“Angela”) and the Rolling Stones (“Sweet Black Angel”). In the film Davis, recalls being visited in prison by Nina Simone, who brought her a balloon—which she kept until it deflated. Even Aretha Franklin—then at the peak of her career and whose father Rev. C.L. Franklin was a surrogate for Martin Luther King, Jr.—offered to post bail for Davis. Franklin was out of the country when Davis’ bail was set at $100,000, but Rodger McAfee a white farmer from San Joaquin Valley, CA used his farm as collateral to help raise Davis’s bail. McAfee is one of the many forgotten heroes of Davis’ story. The same can be said of her primary legal team which included Harold Moore, Jr. and the late Doris Walker, and activist Charlene Mitchell, who ran for President of the United States in 1968 atop the Communist Party ticket, and whose ground game was instrumental in galvanizing support for Davis—literally across the globe. Bettina Apekther remembers letters addressed to Davis from school children in China. Ultimately it was the kinds of everyday folk, who didn’t belong to political organizations, except maybe their church, who expressed outrage at the State’s failure to treat Davis fairly—many of whom who saw her experience with law enforcement and the judicial system as their own experiences writ large. In her recent book Iconic: Decoding Images of the Revolutionary Black Woman, Lakesia D. Johnson reminds readers that the “compulsion to return to Davis’ physical attributes (eyes, mouth, hair) shows how sexual objectification is used to harness her power as a black woman.” (19) In an era dominated by high profile charismatic Black male figures—Malcolm X, Stokely Carmichael, Jim Brown, Muhammad Ali, Huey Newton, Sly Stone—Davis’s sexualized image helped vacate her access to the kinds of charismatic power that made her aforementioned male peers icons within the Black community. The prosecuting attorney in Davis’ trial—the State’s Assistant Attorney General Albert Harris, Jr.—made a even finer point to undermine Davis’ political and cultural authority, by arguing that Davis was not drawn into her support of the Soledad Brothers simply on the basis of her political ideology, but on the basis of her unbridled passion for the group’s most visible figure, George Jackson. Harris was emboldened to make such a claim from several sources, including the FBI, who in notes from their surveillance of Davis’ letters to Jackson and the duo’s prison meeting, described their interactions as “obscene.” Here the FBI sought to further queer Black sexual relations—always, already queered in the White popular imagination—with finely honed historical narratives of Black female lasciviousness, that Davis’ middle class standing, educational attainment, and role as a political theorist were no match for. Even Jackson’s mother weighed in on the subject of Davis in this regard, telling Jet Magazine, that her son Jonathan, “wouldn’t let anybody tell him what to do unless he wanted to do it himself, and I know he wouldn’t let any woman tell him what to do. That I know.” (quoted in Johnson’s Iconic, 22). Harris’ move to portray Davis as a “horny” sycophant—however wrong and problematic—was shrewd, in no small part, due to the fact it would raise questions with Black communities about Davis’ “fitness” as a political martyr. Davis, for example, offered a sharp contrast to other Black women figures who served that role—think of popular depictions of Rosa Parks—both in terms of her willingness to “think out loud” and her sartorial choices. As Edwards observes in her work on charisma and Black leadership, “The formation of black charismatic leadership as a performative structure that would be the race’s bulwark against dehumanization and white supremacist terror…was part of a larger cultural shift towards the politics of respectability.” (7) Harris and his team fully understood how Davis could easily be read as a transgressive figure among rank-and-file Blacks. To their credit, Davis legal team also understood the gender and sexual politics surrounding Davis’ case, and made the equally surprising move of having Davis offer the defenses’ opening statement, allowing her to tell her story, without having to take the stand and be cross-examined. In this context, jurors got to see, not the impassioned-beyond-reason Black women that they were led to believe was the catalyst for chaos that led to Judge Haley’s death, but a reasoned, thoughtful and analytic Black woman. With the State possessing only circumstantial evidences—largely unraveled by the simple question, “why would Davis purchase guns in her name that would be used in a prison break?”—Davis was acquitted (by an all White jury) of all charges on June 4,,1972 after only 13 hours of deliberation. Davis, who participated in the making of the documentary, is a powerful voice throughout the film, providing needed context for much of the film’s arresting archival footage. Yet, Lynch never seems to defer to Davis, finding the truth of Davis’ life, without having the film degenerate into a hagiography. The moment where Lynch captures Davis in a moment of wistful desire for the young George Jackson is priceless. Davis and Jackson’s relationship is deserving of its own film, perhaps directed by a figure like Ava Duvernay, whose Middle of Nowhere owes part of its inspiration to the legacy of the Soledad Brothers and Davis’ own work addressing the Prison Industrial Complex. 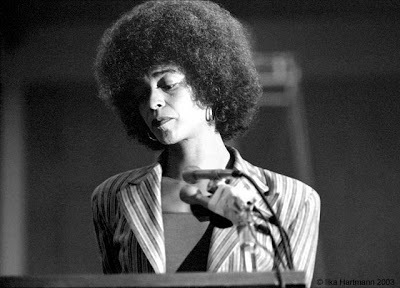 Lynch is to be lauded for recovering for public consumption, Angela Davis the thinker—the figure who was inspired by German Philosopher and political theorist Herbert Marcuse and who was hired by UCLA in 1969 to teach continental philosophy (not Black Studies), and whose first lecture on the political philosophy of Fredrick Douglass was a media event. Davis has since gone on to become one of the more influential thinkers and activist of the late 20th and early 21st centuries as books such as Women, Race, & Class (1983), Women, Culture & Politics (1989), and Blues Legacies and Black Feminism: Gertrude "Ma" Rainey, Bessie Smith, and Billie Holiday (1998) have become iconic within the field of Black Feminist Thought. There is much at stake in this recovery, as Edwards notes, “In the years after the FBI’s ‘cycle of terror’ against her, Davis’s hairstyle and clothing have become commodity fetishes that present black radicalism as a series of exchangeable disarticulated moments that position male consumers as privileged buyers in a sellers’ market of black activist objects.” (145). 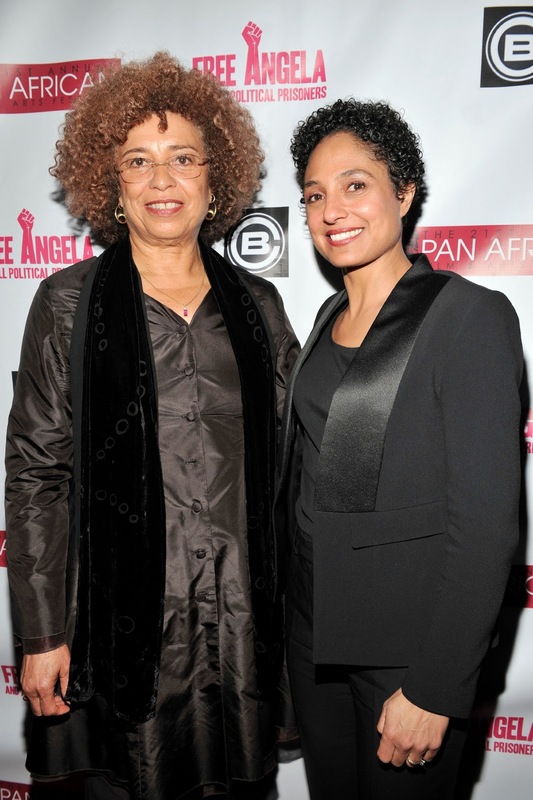 Free Angela and Other Political Prisoners will be released as selected AMC theaters on April 5, 2013 in Washington, DC, Los Angeles, New York, Chicago, Oakland, Philadelphia and Atlanta. Overbrook Entertainment and Roc Nation are among the film’s executive producers.